A major development in the clinical understanding of PD is the recognition that the disorder is not simply one marked by motor difficulty (the 6 cardinal features of parkinsonism are tremor-at-rest, bradykinesia, rigidity, loss of postural reflexes, flexed posture, and freezing of gait) but also by the presence of nonmotor features (Table 1). Patients with PD usually have 10 to 12 nonmotor symptoms, some of which often occur several years before the first motor symptom. This is especially true of reduced sense of smell, constipation, and acting out one’s dreams (also known as rapid eye movement [REM] sleep behavior disorder [RBD]). In a 16-year follow-up of men with RBD, 81% developed a parkinsonian disorder with a mean interval of 13 years. Depression and anxiety are also often early features. Cognitive decline with frank dementia is also common, but this condition usually occurs later in the disease course and is more related to the patient’s current age (late 70s through 90s); dementia is eventually seen in up to 80% of patients with PD. From Chaudhuri KR, et al; Martinez-Martin P, et al; Schenck CH, et al; Aarsland D, et al. With the typical presentation of insidious onset of unilateral rest tremor and bradykinesia (such as small handwriting, decreased arm swing, and decreased leg swing on walking), the diagnosis is relatively easy. Difficulties arise in distinguishing between tremor of PD and tremor seen in essential tremor; when parkinsonism is present without tremor, raising the possibility of so-called atypical parkinsonism or Parkinson-plus states; and when a gait disorder of a slow shuffling gait with loss of balance is observed. The tremor of essential tremor differs from that of PD in that the former is a tremor of action. This can be seen with writing, including the drawing of Archimedes’ spiral, or with the finger-to-nose maneuver. Occasionally a patient may have both conditions, so the diagnosis can be initially puzzling. The neuroimaging procedure known as DaTscan can help distinguish between the two conditions. DaTscan is a single photon emission computer tomography (SPECT) scan in which the radioligand binds to the dopamine transporter that is located on the dopamine nerve terminals in the striatum. In PD, there is asymmetrical loss of the nerve terminals, and hence, an asymmetrical reduction is detected in the DaTscan. In essential tremor there is no loss of radioligand binding. Although this SPECT scan can be helpful in differentiating between the two conditions, the scan is sometimes difficult to interpret and expertise is required. The DaTscan is not helpful in distinguishing between PD and Parkinson-plus syndromes (progressive supranuclear palsy, multiple system atrophy, and cortical basal syndromes) because all of these have striatal dopamine deficiency. The presence of additional neurologic signs -- such as ocular involvement, orthostasis and other forms of dysautonomia, early freezing of gait, early falling, and lack of dramatic response to levodopa therapy – is a clue that the patient may have a Parkinson-plus disorder. A slow, short-stride gait with falling or fear of falling is a common gait disorder. This can sometimes be the onset of PD, but often it is due to cerebrovascular insufficiency (vascular parkinsonism), normal pressure hydrocephalus, or a poorly understood syndrome of senile gait disorder. These conditions do not respond well to levodopa, but this medication could be tried to make sure the patient does not have an unusual presentation of PD. One of the major research activities in PD is the uncovering of gene mutations that cause or are risk factors for PD. The first gene mutation causing familial PD was the gene for α-synuclein (SCNA; PARK1), reported in 1997. Since then, more than 2 dozen genes with mutations that can cause either PD or some other parkinsonian syndrome have been discovered. The PARK label has been applied to 18 of them(Table 2); the others are without this label (Table 3). AD = autosomal dominant; AR = autosomal recessive; GWAS = genome-wide association studies; X-R = X-linked recessive. Modified and updated from Fahn S, et al. AD = autosomal dominant; ALS = amyotrophic lateral sclerosis; AR = autosomal recessive; FTD = frontotemporal dementia; MND = motor neuron disease; PD = Parkinson’s disease. It is estimated that approximately 10% of people with PD have a known gene mutation, with the remainder being sporadic. New gene mutations are being identified almost yearly, so it is expected that many sporadic cases may have an underlying gene mutation that is a risk factor for the disease. 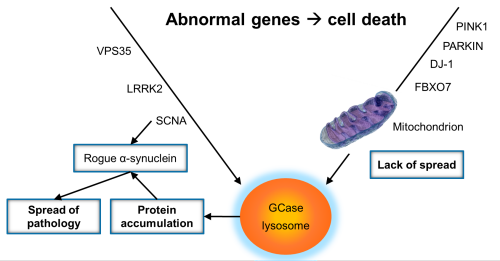 The gene whose mutations are the most common cause of PD is the LRRK2 gene (PARK8), while the gene whose mutations are the most common risk factor for PD is the β-glucocerebrosidase (GBA) gene. This is the gene responsible for Gaucher disease, an autosomal recessive disorder, yet individuals with only a single allelic mutation (heterozygotes) are at risk for PD. Some ethnic groups are enriched populations for specific genetic mutations. For example, the G2019S mutation in the LRRK2 gene is particularly common among members of the North African Berber and Ashkenazi Jewish populations who have PD, and GBA mutations are most common in the Ashkenazi Jewish population. It has been recognized for almost 100 years that the major brunt of neuronal loss with gliosis occurs in the substantia nigra. The pars compacta portion of the nigra, which is home to dopamine-containing neurons, is particularly affected. The locus ceruleus, which houses norepinephrine neurons, is also affected. Both of these structures are normally pigmented with neuromelanin, products of cellular oxidation of dopamine and norepinephrine. Thus, in PD, these structures are depigmented as these neurons are lost; this depigmentation can be detected in gross pathologic inspection of a cross section of the midbrain. Microscopically, intracytoplasmic inclusions referred to as Lewy bodies (Figure 1) can typically be found in both the substantia nigra and locus ceruleus but also in several other regions of the brain and peripheral nervous system. Figure 1. 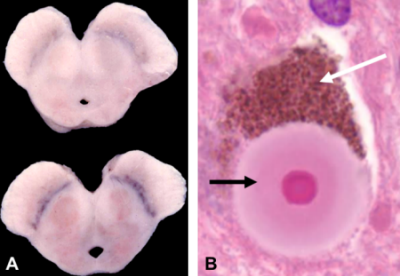 (A) Cross section of the midbrain showing the pigmented substantia nigra in a normal brain (bottom) and depigmented nigra in a brain with PD (upper). 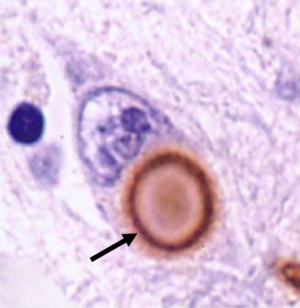 (B) Microscopic section of a substantia nigra pigmented neuron containing neuromelanin (white arrow) and a Lewy body (black arrow) within the cytoplasm of the neuron. The Lewy body has a dense core and a lighter halo. Images courtesy of Jean-Paul Vonsattel, MD. Following the discovery of the SCNA gene mutation, antibodies to α-synuclein were utilized to stain PD brains. An aggregated form of this protein was localized to the halo area of the Lewy body (Figure 2). Figure 2. α-synuclein (depicted by arrow) immunostain of a Lewy body in a substantia nigra neuron. From Hishikawa N, et al. Today, α-synuclein staining is the methodology to discover the presence of Lewy bodies and Lewy neurites (aggregated α-synuclein within nerve axons). Besides PD, other synucleinopathies are dementia with Lewy bodies and multiple system atrophy (in which α-synuclein is present in oligodendroglia, not neurons). Some autopsies without clinical PD contain Lewy bodies; these are called incidental Lewy bodies. There is accumulating evidence that the individuals dying with incidental Lewy bodies have preclinical PD, ie, they would have developed PD if they had lived longer. The normal function of α-synuclein is not well understood. The protein is a normal component within the cytoplasm of nerve terminals, and it is present there as a soluble protein. But it can migrate into and out of membranes, such as the synaptic vesicles, in which it assumes a new configuration as an α-helical structure. Excess amounts of α-synuclein (from excessive synthesis or inadequate degradation) allow the soluble protein to form insoluble β-sheets as oligomers of the protein; these oligomers, also known as protofibrils, form amyloid fibrils, which is the form of α-synuclein that is deposited in Lewy bodies and Lewy neuritis. Some investigators propose that the oligomers are the toxic form of α-synuclein, and that converting this form into amyloid fibrils (Lewy bodies) is a protective mechanism. But others believe the fibrillary form is toxic (see discussion below on spread of α-synuclein). The presence of α-synuclein in the Lewy body is only one piece of evidence of this protein’s involvement in PD. Mutations of α-synuclein cause an aggressive form of PD. [6,15,16] It is important to note that the excessive amount of wild-type α-synuclein that occurs with duplication and triplication of the chromosomal region containing the SCNA gene also causes PD. Braak and colleagues have found that Lewy bodies and neurites first appear in autonomic nerves and in the olfactory bulb (which may be responsible for the early hyposmia) and in the dorsal motor nucleus of the vagus in the medulla before spreading rostrally up the brainstem, and from there to the thalamus and cerebral cortex (Figure 3). Figure 3. Diagram of spread of Lewy bodies and Lewy neurites according to Braak and colleagues. These α-synuclein deposits first appear in the olfactory bulb and the medulla, and over time, they spread rostrally up the brainstem, to the thalamus, to the mesocortex, and finally to the motor and sensory cortices. This rostral spread has been divided into stages: The midbrain and substantia nigra first become affected in Braak stage III. Neurodegeneration follows, so motor symptoms of PD first appear in Braak stage IV. The nonmotor symptoms of PD may be related to other areas of the brainstem being affected with Lewy neuritis. There was a serendipitous discovery that some fetal nigral dopamine neurons grafted into the striatum of patients with PD were found to contain Lewy bodies. These Lewy bodies were present in these grafts after these grafted patients had died, over a dozen years after receiving the grafts. As such young dopamine neurons would not normally contain Lewy bodies, their presence suggests that the host brain is contributing to their formation. It was postulated that perhaps α-synuclein may be transmitted like a prion protein. Subsequently, fibrils of synthetic α-synuclein were experimentally introduced into striatum of rodents and found to have spread to other neurons connected to the striatum, forming Lewy body-like structures and inducing neurodegeneration, including in the substantia nigra. As these animals developed symptoms of parkinsonism, it is anticipated that they will be utilized for future research trying to discover agents that could prevent such spread of α-synuclein and halt progression of PD. α-synuclein is degraded in the lysosome by a process called chaperone-mediated autophagy. However, the mutant forms of the protein are unable to be degraded, resulting in their accumulation and also blocking the chaperone-mediated autophagy of other proteins in the cell. This lack of a "garbage disposal" for altered or misfolded proteins would lead to protein accumulation, which could be a major mechanism leading to the cell's death. A primary goal of the treatment of PD is curing the disease by stopping its progression and restoring the patient to a healthy, normal state. Restoration seems unattainable at present, but slowing disease progression based on the above advances in the basic science of PD seems approachable in the not so distant future. Many attempts at disease modification have been carried out in a number of controlled clinical trials. Most drug trials ended in failure, including trials of coenzyme Q10, creatine, pramipexole, tocopherol, riluzole, and two antiapoptotic agents: TCH346 and CEP-1347. Two controlled surgical trials also failed to slow or reverse PD: intraputaminal infusions of the glial-derived trophic factor (GDNF) and the gene therapy trial of implants of viral vectors containing the gene for neurturin (a member of the GDNF family). So far, only trials of the monoamine oxidase type B inhibitors selegiline[27,28] and rasagiline have provided hints of slowing clinical progression, although a symptomatic effect could possibly account for their benefit. Levodopa was also studied, but interpretation of the results showed incongruity between the clinical and imaging components of the trial. A recent open-label trial suggests that exanatide might have neuroprotective potential. It would be most cost-effective if a suitable animal could be used to test potential neuroprotective agents. As mentioned above, new animal models based on genetics or spread of rogue α-synuclein may prove to be feasible models to study potential neuroprotective agents. Psychogenic disorders are those presumed to have a psychological cause, as opposed to organic disease. [32-34] In the fifth edition of the Diagnostic and Statistical Manual of Mental Disorders (DSM-5), psychogenic disorders are mainly categorized as Conversion Disorders or Functional Neurological Symptom Disorders, under the general category of Somatic Symptoms and Related Disorders. They are common in all aspects of neurologic practice. In a prospective study of 3781 patients in Scotland referred from primary care to neurologic clinics, 18% were thought to have conversion symptoms -- either motor, sensory, or nonepileptic attacks. Patients with psychogenic movement disorders can present with any type of involuntary movement; they pose problems for both diagnosis and treatment. It is important to recognize that the movements are truly involuntary for these patients, and that their distress and disability are significant. In rare cases, patients may be making the movements voluntarily to satisfy a psychological need; this is called a factitious disorder. Similarly rarely, patients may be making the movements voluntarily to achieve a specific goal, such as the acquisition of drugs. In this case, there is no fundamental psychiatric problem, and the disorder is referred to as malingering. Neither neurologists nor psychiatrists are good at detecting when a patient is factitious or malingering as opposed to conversion. Doctors need to be thoughtful about this when seeing patients, but most cases will be conversion and can be considered as such. There are a number of general features that make one suspicious that a disorder is psychogenic. There are also specific features for different movement disorders. Additionally, in recent years, there are some laboratory findings, mostly clinical neurophysiologic tests, that can be useful. It is better to make the diagnosis on positive grounds than to just make it a diagnosis of exclusion. However, in the end, the diagnosis is not always certain. Fahn and Williams proposed a scale for level of certainty that is commonly used. "Documented" implies remittance with suggestion, physiotherapy, psychotherapy or placebos. "Clinically established" requires two features commonly recognized as characteristic of psychogenic movement disorders, one of which must be either (1) inconsistency over time, (2) incongruity with known movement disorders, or (3) clinical neurophysiologic evidence. "Probable" and "possible" are lower levels of certainty. The clinical neurophysiologic methods are getting better, and there has been a suggestion that there might be a category of "laboratory supported, definite" diagnosis. General features that help make the diagnosis include abrupt onset and periods of normality; patients may be able to specify the precise moment when the disorder began. There might be inconsistency in the movements and marked variability from time to time, even with respect to the types of movement. There might be tremor some of the time and myoclonus at other times. Movements may be diminished when patients are distracted. Patients may have exhaustion and disability seemingly disproportionate to the symptoms manifested. There might be give-way weakness and nonanatomic patterns of sensory loss. A history of other somatizations, secondary gain, and pending litigation should be red flags. Tremor is one of the most common forms of psychogenic movement disorder. It is interesting to note that it has been documented with instrumental monitoring that patients believe their tremor is present more of the time than it actually is. Specific clinical features include the tremor's presence in rest, posture, and action, which is rare for any organic tremor. Tremor tends to be absent in the fingers. The frequency might vary from time to time, and, importantly, it might be entrainable. There is an important clinical test that is done by asking the patient to tap at different frequencies: The patient voluntarily taps one body part at a certain rate while observing the tremor in another body part. The tremor might take up the frequency of the voluntary tapping or at least change in frequency. The patient might also have some apparent difficulty actually tapping at the requested frequency. Of course, there cannot be entrainment unless there is voluntary tapping. A variation on this is the ballistic movement test, where one limb, on command, makes a quick movement. Psychogenic tremor might pause in this circumstance. Clinical neurophysiologic testing is very helpful with tremor. A recent study showed that a combination of 6 tests might even be close to 100% sensitive and specific. These tests include (1) incorrect tapping frequency upon request, (2) entrainment or change in frequency with tapping with another body part, (3) the ballistic movement test, (4) tonic contraction at tremor onset, (5) coherence between tremor in different body parts, and (6) increase in tremor amplitude with loading. The first 3 are the same as the clinical signs mentioned previously, but they are more accurately and sensitively assessed physiologically. Tonic contraction at the onset of a postural tremor and increase in amplitude of tremor when weighting a limb with various loads are not generally seen in organic tremors. A test of particular interest is the coherence study: Psychogenic tremor tends to be in phase in all body parts that are involved. In most organic tremors (with exception of orthostatic tremor), shaking body parts may have similar frequencies but they are not in phase. Myoclonus, also a common psychogenic disorder, involves exaggerated responses that resemble startling. Many patients with psychogenic jerks have movements that are actually too slow or too complex to be organic myoclonus, but this is the best categorization for them. Another feature, when there is stimulus sensitivity, is long and variable delay from the stimulus. When patients have an apparent stimulus sensitivity to somatosensory stimulation, one technique is to stop the tendon hammer in a series of taps just short of contact -- often there might be a response anyway. Again, clinical neurophysiologic testing can be very useful. First, one can examine the electromyogram (EMG) characteristics underlying the movement to see if they fit organic myoclonus. If there is stimulus sensitivity, examination of the latencies is essentially diagnostic. Psychogenic myoclonus has much longer latencies than organic myoclonus, similar to voluntary reaction times, and the latencies are highly variable. A more sophisticated study is to look for the electroencephalogram (EEG) correlate of the myoclonus by back-averaging the EEG on the start of the EMG of the myoclonus. In psychogenic myoclonus, there is often an EEG potential preceding the movement similar to the EEG potential seen with voluntary movements called the Bereitschaftspotential. This is a negative potential over the central regions of the scalp that gradually rises over a period of about 1 second. Such a potential was seen in 25 of 29 patients with psychogenic myoclonus, whereas it is never seen in patients with organic myoclonus. Psychogenic dystonia is also common, but the diagnosis is often difficult. The general rules, such as sudden onset and variability, can be applied. Fixed dystonia, in particular, is often psychogenic. Most organic dystonia, particularly at onset, is dynamic and perhaps only action induced. A particular problem is posttraumatic fixed dystonia, which is often seen together with complex regional pain syndrome (CRPS). The nature of this disorder is hotly debated, with most authorities believing that the majority of dystonia in this setting is psychogenic. Clinical neurophysiology is not yet very helpful in the differential diagnosis, as many psychogenic patients having abnormalities similar to those seen in organic dystonia patients. A normal blink reflex recovery curve can identify patients with psychogenic blepharospasm. More work is needed in this area. Of the other disorders, psychogenic gait disorders are perhaps the most common. Most of these disorders look strange and are incongruent with known gait disorders, but this criterion is difficult to apply. One subjective assessment that can be useful is that the balance of the patients is much better than the claim. It is helpful to be aware of the common patterns of psychogenic gait disorders, such as knee buckling. [52,53] Gait patterns are inconsistent over time, and this can be quantified with gait analysis techniques. Upon making the diagnosis of a psychogenic movement disorder, the first concern is telling the patient. This can be extremely difficult. Patients may be reluctant to accept the diagnosis, become angry, and run off to the next doctor. Each patient must be approached individually. The terminology used in the discussion may be important. Some authorities believe it is important to use the term "psychogenic," as it is highly likely that psychological factors are etiologic and that they must be approached for a successful treatment. Others prefer the term "functional." Even though it can be considered ambiguous, this word conveys the idea of a disorder of brain function (not structure), which may be more acceptable to patients. Moreover, functional is the term currently used in the DSM-5. 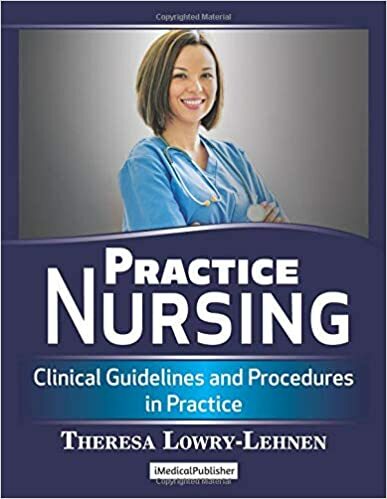 In any event, the method of describing what the condition is, giving information about its cause, and explaining how it can be treated is likely more important than the term used, since patients will likely learn all the terms on their own anyway. Showing patients the physical signs used to make the diagnosis can be helpful. Psychotherapy of some sort is necessary for most patients with psychogenic movement disorders. Cognitive behavioral therapy, which can even be provided as a self-directed program, is popular at the moment. It seems reasonable to consider physiotherapy for many patients, but the evidence for this intervention is weak. Pharmacotherapy can also be useful for dealing with psychiatric comorbidities, but there is not much formal evidence for this approach. The prognosis for patients with psychogenic movement disorders is generally poor. A recent meta-analysis of 24 studies examining functional motor symptoms found that 49% of treated (for mostly psychological symptoms) and 39% of untreated patients were the same or worse at follow up.. We need to do better. In 1872, George Huntington published his essay titled "On Chorea." However, because there are many other manifestations of the disease and chorea might not even be present, the term Huntington's disease is more appropriate. Huntington's disease is a model neurobehavioral and neurodegenerative disease for which the discovery of a gene mutation in 1993 has gradually translated into improved understanding of the mechanisms of cell death and pathogenesis-targeted treatments. The diagnosis can be confirmed by a DNA test showing ≥40 CAG repeats in the huntingtin (Htt) gene. The prevalence of HD varies from one geographic area to another, based on a diaspora from southeast England following the founder mutation in the early 17th century. Based on a meta-analysis of 13 studies, the worldwide prevalence of HD was found to be 2.71 per 100,000 (95% confidence interval [CI], 1.55-4.72) and the overall incidence was 0.38 per 100,000 per year (95% CI, 0.16-0.94). The estimated prevalence of HD in the United States is about 6 cases per 100,000 people, which translates to about 30,000 individuals with HD and another 200,000 at risk of developing the disease. In contrast, in certain regions of the world the prevalence is as high as 560 per 100,000 (Moray Firth, Scotland) and 700 per 100,000 (Lake Maracaibo, Venezuela). Chorea, the clinical hallmark of HD, consists of involuntary, continual, abrupt, rapid, brief, unsustained, irregular movements that flow randomly from one body part to another. Patients can partially and temporarily suppress the chorea and frequently camouflage some of the movements by incorporating them into semipurposeful activities (parakinesia). The inability to maintain voluntary contraction (motor impersistence), such as manual grip (milkmaid grip) or tongue protrusion, is a characteristic feature of chorea that results in the dropping of objects and clumsiness. In addition to chorea, other presenting symptoms of HD include gait and balance difficulties, irritability, depression, clumsiness, speech difficulty, memory loss, dropping of objects, lack of motivation, paranoia, intellectual decline, sleep disturbance, hallucination, weight loss, and sexual problems. Besides chorea, other motor symptoms that typically affect patients with HD include dystonia, postural instability, ataxia, slow saccades, dystonia, bruxism, myoclonus, tics and Tourettism, dysarthria, dysphagia, and aerophagia. 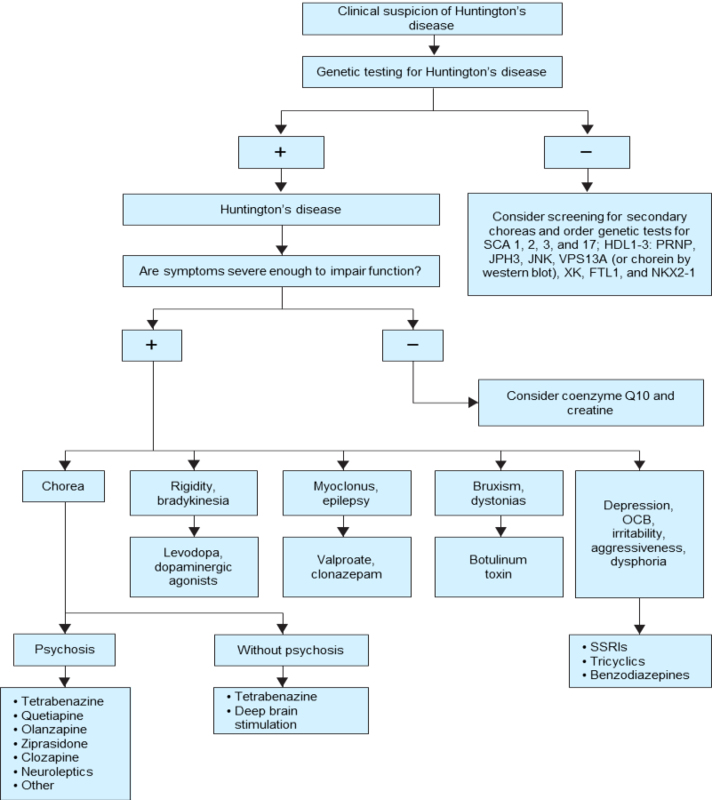 The Unified Huntington's Disease Rating Scale (UHDRS) was developed to assess and quantify various clinical features of HD, specifically motor function, cognitive function, behavioral abnormalities, and functional capacity. Hung-up and pendular reflexes are also typically present in patients with HD. Besides chorea and other motor abnormalities, the HD cardinal triad includes cognitive decline and various psychiatric symptoms, particularly depression, personality changes, and compulsive behavior. The observed increased risk of suicide may in part be related to underlying depression as well as impulsivity. In addition to motor, cognitive, and behavioral abnormalities, most patients with HD lose weight during the course of their disease, despite increased appetite. About 10% of HD cases have their onset before age 20. This juvenile HD is usually inherited from the father (father vs mother inheritance for patients with onset before 10 years is 3:1). 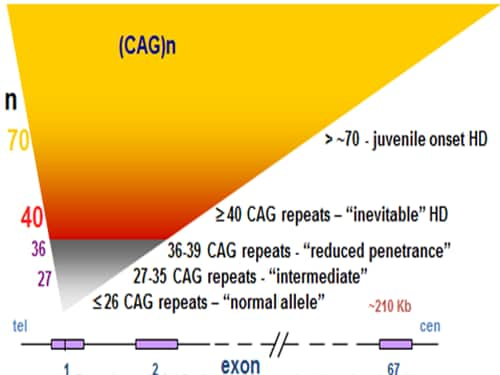 Juvenile HD is associated with higher CAG repeats (see below). Juvenile HD typically presents with the combination of progressive parkinsonism, dementia, ataxia, myoclonus, and seizures. The natural course of HD varies; on the average, duration of illness from onset to death is about 15 years for adult HD, but it is about 4 to 5 years shorter for the juvenile variant. Clinical-pathologic studies have demonstrated a strong inverse correlation between age at onset and progression of the disease as well as severity of striatal degeneration. Based on an analysis of 569 subjects prospectively followed over a mean follow-up of 8.2 years, CAG repeat length alone showed a statistically significant but small effect on the progression of all clinical measures; smaller triplet expansion was associated with a slower decline than larger expansion. However, some patients who have pathologic CAG expansion have a relatively benign, nonprogressive course. Progressive motor dysfunction, dementia, dysphagia, and incontinence eventually lead to institutionalization and death from aspiration, infection, and poor nutrition. Caudate atrophy, as measured by the ratio of intercaudate to outer-table distances, has traditionally been used as an index of striatal atrophy in HD. Subsequent studies, however, have shown that a reduction in the volume of putamen, as measured by magnetic resonance imaging (MRI), is a more sensitive index of neurologic dysfunction than caudate atrophy. Other imaging studies have suggested that myelin breakdown and changes in ferritin iron distribution underlie the regional toxicity and may be important in the pathogenesis of HD. Pre-HD individuals have been found to have lower gross gray matter and white matter volume; voxel-wise analysis demonstrated local gray matter volume loss, most notably in regions consistent with basal ganglia-thalamocortical pathways, whereas pre-HD individuals showed widespread reductions in white matter integrity. Besides predominant striatal involvement, atrophy of the accumbens nucleus and pallidum are also apparent in premanifest HD. The whole-brain and caudate atrophy rates were found to correlate with the UHDRS total functional capacity score and with cognitive and quantitative motor measures. As microglial activation has been found to correlate with neuronal degeneration, techniques designed to image microglia activation, such as [(11)C](R)-PK11195 positron emission tomography (PET), show that microglia activation correlates with severity of the disease (eg, UHDRS score). Pathologic studies have provided evidence for primary involvement of the basal ganglia-thalamocortical circuitry in HD. Based on a detailed neuropathologic examination of a total of 523 HD brains, the investigators found that the size of the expanded CAG repeat correlates well with the degree of striatal but not cortical pathology. Chorea seems to be related to the loss of medium spiny striatal neurons projecting to the lateral pallidum (GPe), whereas rigid-akinetic symptoms correlate with the additional loss of striatal neurons projecting to the substantia nigra compacta (SNc) and medial pallidum (GPi). Huntingtin (Htt), the product of the HD gene (see below), is expressed throughout the brain in both affected and unaffected regions; therefore, its contribution to neurodegeneration in HD is unclear. The finding of neuronal intranuclear inclusions and dystrophic neurites in the two regions that are most affected in HD -- the cortex and the striatum -- has revolutionized our understanding of the genetic-pathologic mechanisms of this heredodegenerative disorder. Mild degeneration in the SN, coupled with postsynaptic loss of dopamine receptors, might be responsible for the parkinsonian findings in some HD patients. Loss of the medium-sized spiny neurons, which normally constitute 80% of all striatal neurons, is associated with a marked decrease in γ-aminobutyric acid (GABA) and enkephalin levels. In contrast, the cholinergic and somatostatin striatal interneurons seem to be relatively spared in HD. The mutation responsible for HD consists of an unstable expansion of the CAG repeat sequence in the 5’ end of a large (210 kb) gene, huntingtin (Htt), also called IT15. This gene, located at 4p16.3, contains 67 exons and encodes a previously unknown 348-kDa protein named Htt. Although the DNA diagnosis of HD requires ≥40 CAG repeats, several studies have demonstrated that family members of HD patients with CAG repeat in the intermediate range (27-35) had some abnormalities in motor, cognitive, and behavioral domains of UHDRS when compared to healthy controls[72,73]; see Figure 5. Figure 5. Expansion of CAG repeats in Huntington gene. In HD the polyglutamine segment near the NH2 is elongated. Adapted from Fahn S, et al. There are currently three types of HD transgenic mouse models: (1) mice expressing fragments, usually one or two exons of the human huntingtin gene that contain the polyglutamine expansion (R6/2 and N-171-82Q mice); (2) transgenic mice expressing the full-length human huntingtin gene with expanded polyglutamine tract (YAC128 mice); and (3) knock-in mice with pathogenic CAG repeats inserted into the existing CAG expansion (HdhQIII ). Unfortunately, none of these models closely simulate the human disease. In addition to the subprimate models, progress is being made in developing a transgenic model of HD in a rhesus macaque monkey that expresses polyglutamine-expanded Htt. Despite the discovery of the causative gene more than 2 decades ago, the understanding of the pathoegenesis of HD is still quite elementary. Multiple processes have been postulated to relate CAG expansion to neurodegeneration. Treatment of HD begins with education about the disease, including its natural history, genetics, and insight-oriented therapy. Although HD is one of few neurodegenerative diseases for which the diagnosis can be made long before the onset of clinical symptoms, and it is therefore an excellent model for testing early neuroprotective treatments, no disease-modifying therapies have been found as yet. [74-76] Until such therapies are available, the management of patients with HD will focus primarily on relief of symptoms designed to improve their quality of life. The only drug approved for the treatment of chorea associated with HD is is tetrabenazine, which was approved by the US Food and Drug Administration (FDA) in 2008. There are no other approved drugs for any other symptom of HD. Tetrabenazine is a potent, selective, reversible inhibitor of striatal vesicular monoamine transporter type 2 (VMAT2); it causes depletion of striatal dopamine, and has been shown to be effective in the treatment of a variety of hyperkinetic movement disorders including chorea, tics, and tardive dyskinesia. Although tetrabenazine can cause or exacerbate depression, sedation, akathisia, and parkinsonism, when the dose is increased and adjusted judiciously the drug is effective and safe. In a multicenter, double-blind, placebo-controlled trial (TETRA-HD) of tetrabenazine involving 84 ambulatory patients with HD, tetrabenazine treatment resulted in a reduction of 5.0 units in chorea severity compared with a reduction of 1.5 units on placebo treatment (adjusted mean effect size = -3.5 ± 0.8 UHDRS units [mean ± standard error]; 95% CI, -5.2 to -1.9; P <.0001). The Cochrane Database of Systematic Reviews, which examined 22 trials (1254 subjects), concluded that based on available evidence, only tetrabenazine showed a clear efficacy for the control of chorea. Figure 6. Therapeutic approaches for the treatment of HD. From Jankovic J. Several promising drugs are currently being investigated as symptomative and potential disease-modifying therapies (Table 4). Fahn S, Jankovic J, Hallett M. Principles and Practice of Movement Disorders. 2nd ed. Edinburgh, Scotland: Saunders Elsevier; 2011:chap 1, Table 5. Hallett M, Lang AE, Jankovic J, et al, eds. Psychogenic Movement Disorders and Other Conversion Disorders. Cambridge, England: Cambridge University Press; 2011:324. Jimenez-Shahed J, Jankovic J. Tetrabenazine for treatment of chorea associated with Huntington’s disease. Expert Opin Orphan Drugs. In press.